Wembley's giant arch was bathed in the blue, white and red of the Tricolore, the flag itself was stretched out across the turf while a giant mosaic in France's national colours decorated one end of the stadium. The friendly played out between England and France carried no competitive relevance - but on a scale of global significance it was impossible to overstate its meaning. This was a universal sport sending a universal message as France mourns the atrocities in Paris on Friday that claimed the lives of 129 people and left so many injured. These two old sporting adversaries set the traditional rivalries aside as Wembley became a symbol of solidarity, never more so than when both sets of fans joined together before kick-off to sing the French national anthem "La Marseillaise", with the words "Against us tyranny's bloody banner is raised" carrying particular resonance. And, in this context, it said so much about why the French Football Federation felt this match must go ahead, as a powerful gesture from a proud nation determined to show they will not allow these attacks to impinge on one of their great unifying forces, namely sport. Wembley heightened security in response to Friday's events, with sniffer dogs around the stadium from early on Tuesday, helicopters circling overhead hours before kick-off and armed police in evidence as supporters, including 1,400 following France, arrived at the stadium. It was a full-scale operation brought into even sharper relief by events in Hannover at the same time, as the scheduled friendly between Germany and the Netherlands was called off because of "an intention to ignite explosives". As the rain lashed Wembley, it was clear in the build-up to kick-off that this was going to be a night of emotion, poignancy and defiance that would at times, inevitably, also be sombre. The mood among England supporters as they flooded the concourses before the game was that this was a time to set time-honoured sporting arguments to one side and stand alongside their French counterparts and a nation in suffering. France's players - with 13 in the squad who are playing or have played in the Premier League - were given a warm ovation as they came out to warm up, returning the gesture by gathering in the centre circle to acknowledge the applause. This was a French team that heard the sound of suicide bombers outside the Stade de France during the friendly with Germany only five days ago. This was a night that understandably tested their emotions. The vast stadium fell silent in the moments before kick-off as the teams waited in the tunnel. England defender Kyle Walker sought out his Tottenham team-mate and France captain Hugo Lloris, a gesture the goalkeeper clearly appreciated. England manager Roy Hodgson embraced his counterpart Didier Deschamps before three floral tributes were laid in the technical areas by a group of dignitaries including HRH The Duke Of Cambridge, Prime Minister David Cameron, French Secretary Of State for Urban Affairs, Youth And Sport Patrick Kanner, FA chairman Greg Dyke and FFF President Noel Le Graet. It was followed by that gloriously unified version of "La Marseillaise" and a perfectly-observed minute's silence, during which one French fan, draped in the Tricolore, removed his glasses to wipe away tears with the colours of his country. The French flags on show bore slogans of hope and thanks, from "United We Stand" and "Play For Paris" to "Thanks To The World". It was night when the symbolism stretched far beyond Wembley. As the game began the France fans perched high in a corner of Wembley waved the Tricolore, but it was noticeable that so many England fans also carried that flag in a further gesture of unity. This was not a night to examine the nuances of Hodgson's plans for Euro 2016. This was not a night for discussing who might make the plane to France next summer. This was a night to reaffirm the words of France coach Deschamps, whose pre-match message was: "Sport knows no colour, no religion. All are welcome in sport - it brings people together, unifies them." And this was the message on public display for the world in every moment at Wembley. Sport can offer comfort, send these strong messages, and it was delivered loud and clear on this emotion-charged occasion. When Lassana Diarra, the France midfielder who lost his cousin in the attacks on the French capital, came on as a 57th minute substitute, Wembley rose to him. The result of the game will not register - his strength and the strength of the French team will be the victory. 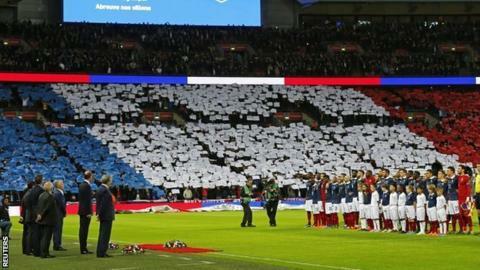 Wembley opened its arms to France and French team. The tone was respectful and reflected great credit on the Football Association, who handled every aspect of the night with great sensitivity. As the final seconds were played out, the French section of Wembley delivered one final, rousing rendition of "La Marseillaise" that drew loud applause from England's fans. There were compelling arguments from both sides on whether this fixture should have been played so soon after Friday's events but once the FFF made it clear this was its desire, it was the fervent wish of everyone involved that it should be a dignified, fitting memorial and a demonstration that life and sport goes on. In that respect, and in all others, it was a triumph.